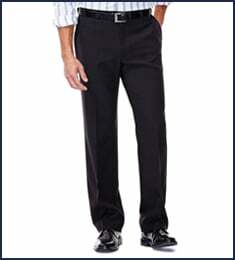 E-CLO™ Stria Dress Pant is rated 4.5 out of 5 by 178. 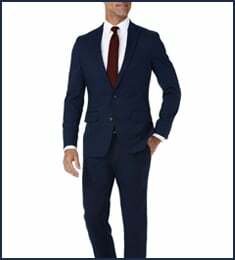 Rated 5 out of 5 by Jim F from I was adding more choices to my wardrobe, Ready for Easter,a number of color to choose from. Rated 5 out of 5 by Marty10 from Excellent Pants I bought 5 pair, sight unseen, online. Fast delivery. Pants as advertised. Perfect fit. Rated 5 out of 5 by kam39 from Great quality. Purchased Two pairs of pants. They fit great and quality of fabric is really good. Price was amazingly reasonable. Rated 1 out of 5 by DAN Dorffman from Too clingy, like wearing Glad Garbage Bags Bought these pants made with recycled water bottles. Certainly feels like you are wearing plastic. Too hot, too clingy to your legs. Not comfortable at all. Haggar has some nice slacks BUT NOT THIS ONE. Rated 5 out of 5 by wlane from Great price and great pants!! 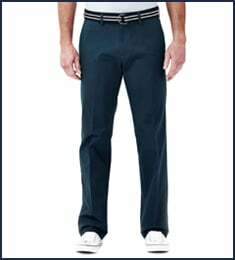 These are great pants and with the sale pricing were an incredible price. 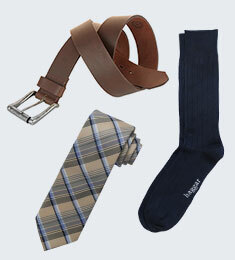 These slacks are professional in appearance and wear exceptionally well.